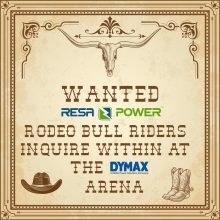 As a part of NETA Powertest 2016 in Fort Worth, Texas, RESA Power and DYMAX hosted a hospitality suite on Monday, March 14th. Attendees were invited to join the RESA Rodeo and ride the mechanical bull. Cowboys and cowgirls lined up for a turn at 8 seconds on the intimidating stag. Some lasted longer than the legendary 8 seconds, some lasted less; however, fun was had by all!